I love shellfish. I love them even more when they are freshly hauled from the sea, such that their flesh is still sweet without the aid of seasoning. 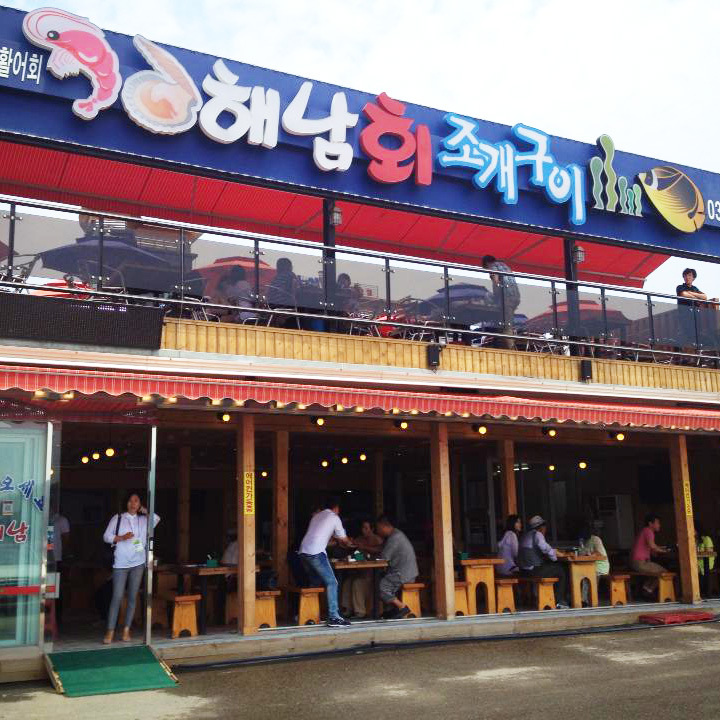 So imagine my delight when I discovered Haenam Jogaeguee, a two-storey restaurant that sits along Eurwangni Beach in Incheon, a two-minute walk from Golden Sky Resort. Actually, there is a strip of two-storey restaurants along that beach, and most specialises in seafood caught from the sea. Take your pick, although be warned that all these dining establishments get really crowded on weekend nights. And that was why we chose to come here in the day for lunch. In Haenam Jogaeguee, all tables come with a gas stove in the middle and it is on this stove that diners can barbeque a dazzling variety of shellfish, most of which I cannot name. While he ‘shopped’ downstairs, I made my way to the upper deck and settled into a good seat with a clear view of the sea. That, plus the cool, salty breeze, provided the perfect setting for a casual seafood feast. My ambitious host chose a great variety of shellfish to barbeque (I could only recognise scallops and mussels! 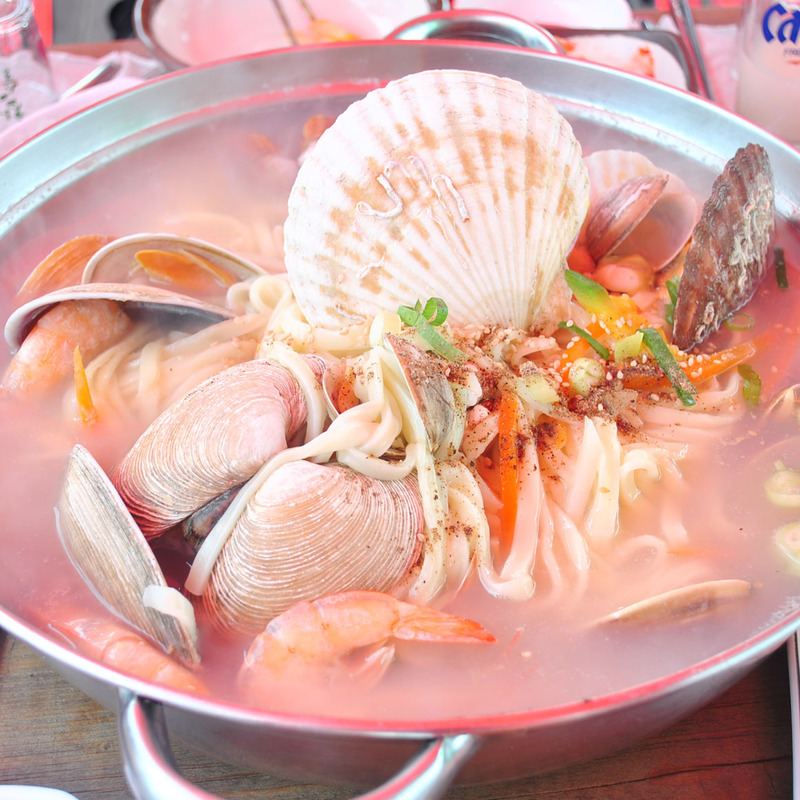 ), as well as a pot of hand-cut noodles cooked in a seafood broth and with plenty more shellfish and plump squid. As with all Korean meals, the restaurant served a selection of complimentary appetisers such as kimchi and mashed pumpkin. It was obvious right from the start that there was no way we could finish every item! Along with the seafood, we ordered several bottles of Cass, a local beer; makgeolli, a traditional rice and wheat liquor that is just so good with all sorts of Korean cuisine; and soju. Well, you know, it is never too early to start drinking! 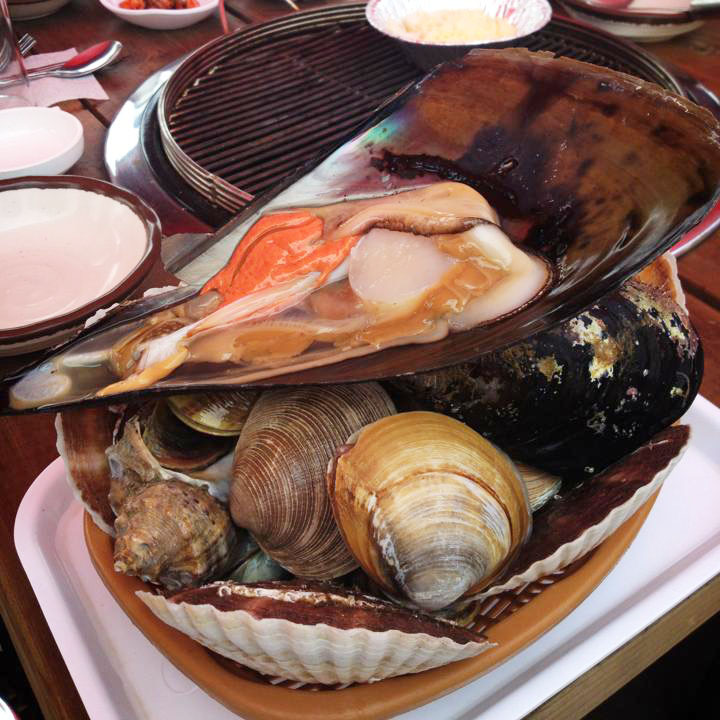 Fresh seafood hardly ever disappoints and this meal was the best I had eaten on my trip to South Korea this time. The fancy meals at five-star international hotels in Seoul and Jeju came nowhere close. Haenam Jogaeguee is not a fancy restaurant and much of the weekend crowd are locals who are escaping busy Seoul city for a relaxing day by the sea. Diners barbeque their food on their own, eat however fast or slow they like, and toss the empty shells into a plastic bucket under their table. And perhaps because it is not yet a huge draw with the international tourist crowd, a seafood feast at Haenam Jogaeguee is still incredibly kind on the wallet. Our bill came up to about US$60 for four people. Imagine that! I’m very sure that the bill would be much lesser for diners who don’t go madly overboard with the selection of shellfish and order far more than their tummies could accommodate.